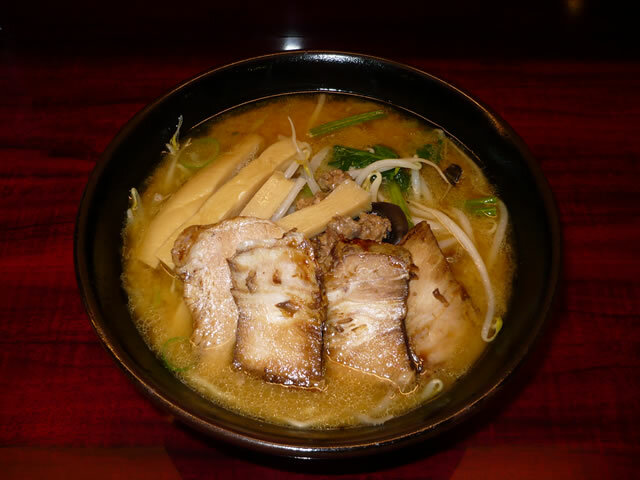 This is UU-Hokkaido's official tourist information about Kamikawa town and Sounkyo. See the main highlight of Sounkyo. 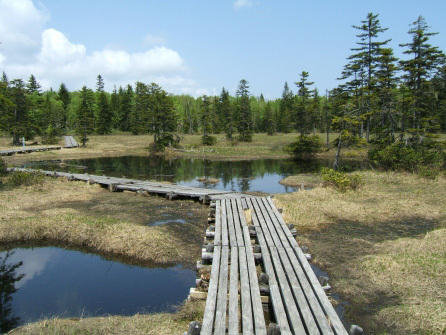 Please come and visit the great nature of Hokkaido, at Kamikawa-cho of Daisetsuzan. 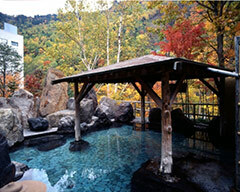 The hot springs at the foot of the mountain in Japan's largest national park, Daisetsuzan National Park. 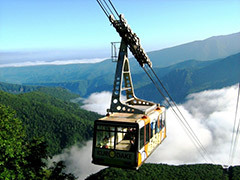 It is a full-scale mountain resort with 17 hotels and inns in a nature rich gorge. 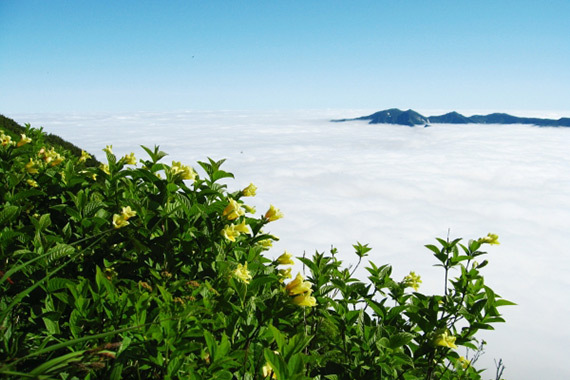 1,984 meters above sea level, it offers a view of Kurodake's treasure house of outstanding Japanese alpine plants. 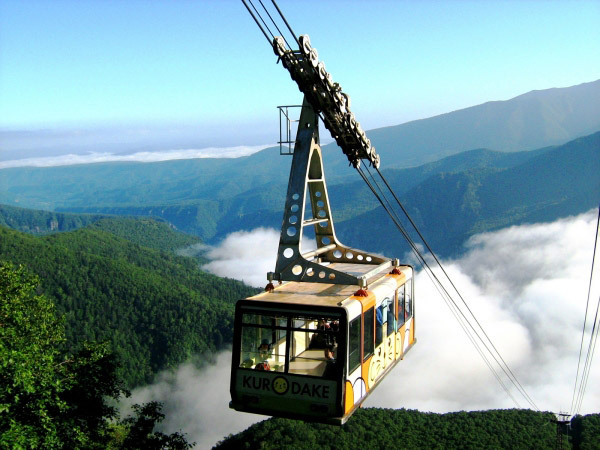 You can take the 101- passenger ropeway by Kurodake Ropeway from the Sounkyo hot-spring resort to the Kurodake fifth stage in seven minutes one way. 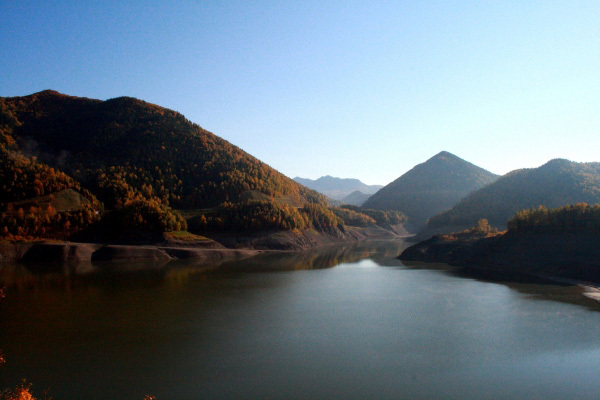 In winter this area becomes a popular skiing spot. Both rock faces of the large gorge extend for approximately 24km along the Ishikari River flowing from Daisetsuzan and have slim stick precipices with hexagons, and four cornered points. 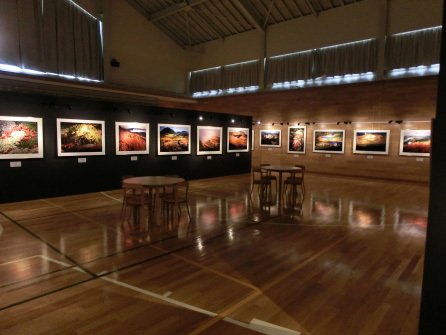 Obako is a place where you can see nature on a global scale, up close. 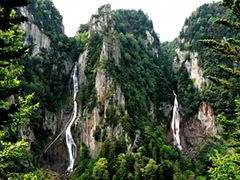 There are waterfalls in Sounkyo from Japan's Top 100 Waterfalls. The point of beauty for the waterfalls in Sounkyo are the colummer joints found on each side of them. The Milky Way Falls (the female waterfall) runs like layers of fine white thread and the Shooting Stars Falls (the male waterfall) runs as one thick thread. 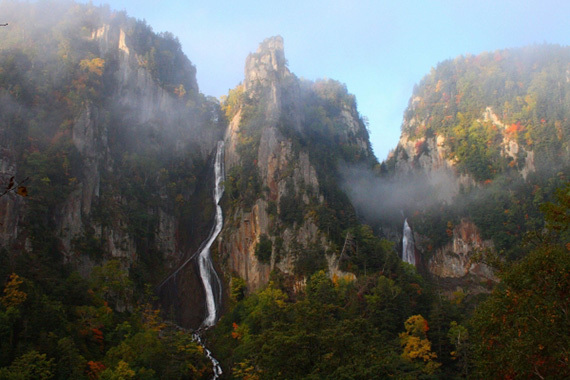 The 2 waterfalls are also called the husband and wife waterfalls. 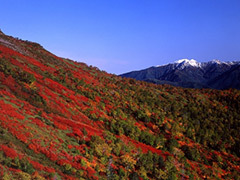 The Daisetsuzan mountain range, where the changing of the leaves comes first in Japan. 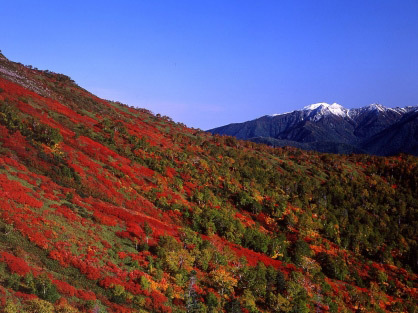 In Ginsendai you can see the colorfully stained mountain sides that create a view that seems like a landscape painting of beautiful nature. It is breath-takingly beautiful. The ice is molded over a period of 3 months, allowing it to freeze in layers below freezing temperature. 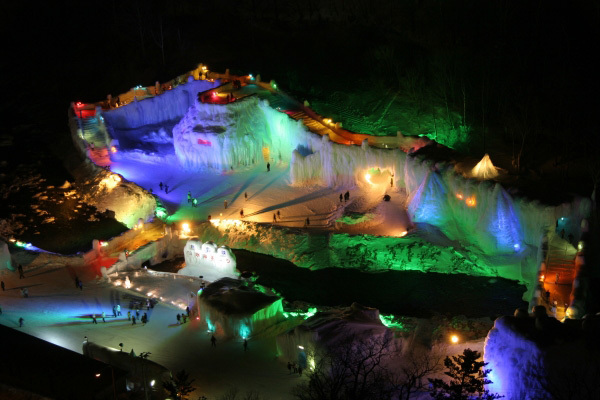 7 colors light up to create a fantastic world.This is one of the leading Hokkaido winter festivals with fireworks launched on the weekend. 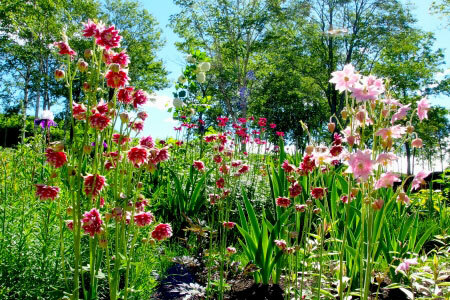 This is a flower garden of the forest where approximately 500 flower species are displayed under 5 themes. 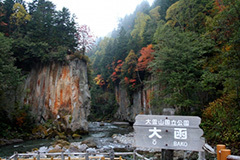 The areas of interest in the garden (mori no engeikan) are built considering the natural landscape and follow 7 themes. 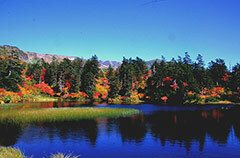 With the slow growth of the forest, you too, can take your time to envelop yourself in the surrounding nature. 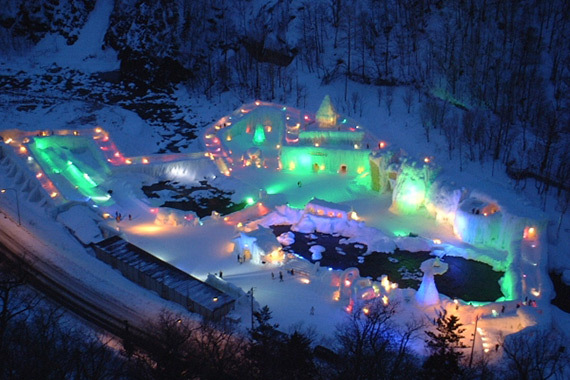 It was the main venue of the 2015 Daisetsu Hokkaido Garden Show. 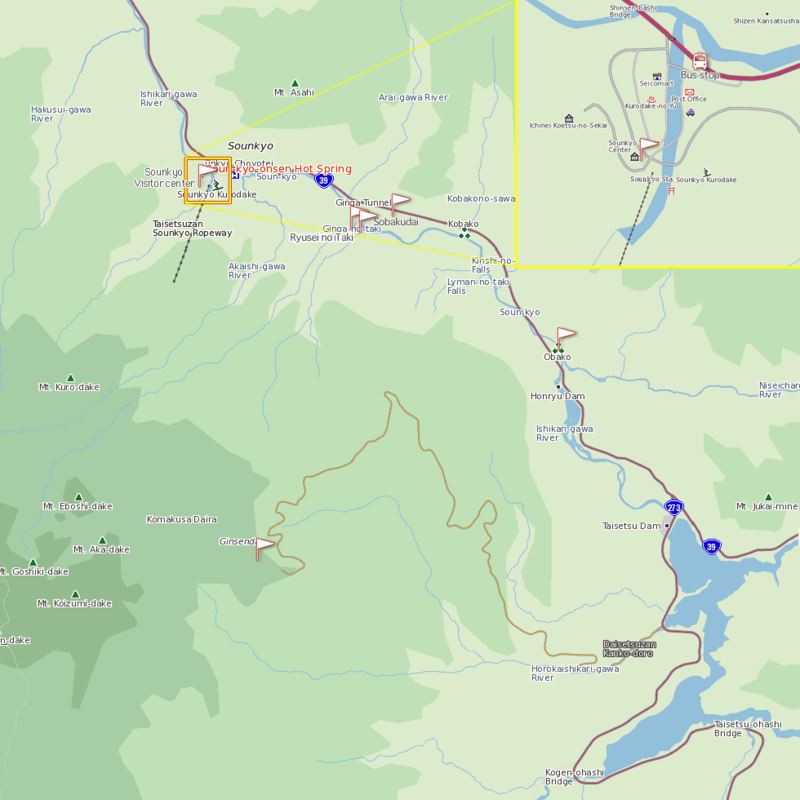 An approximately 4 hour walking course. 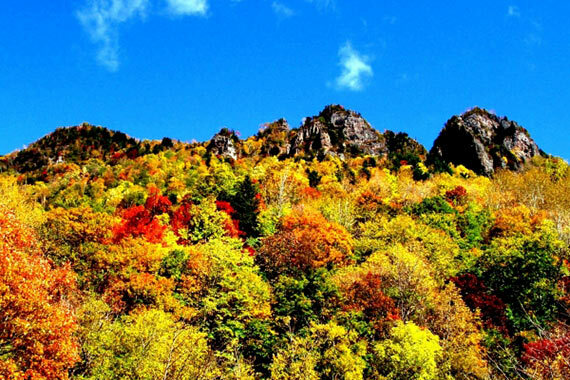 In summer there are alpine plants, and in autumn the changing leaves are beautiful. 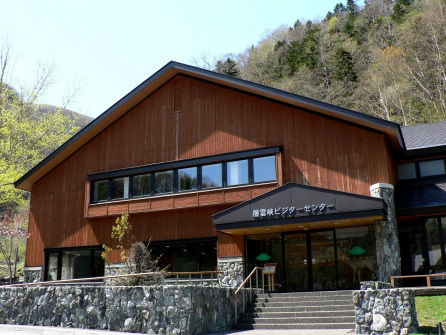 Begin the course from the entrance at the Higuma Information Center after taking a lecture. 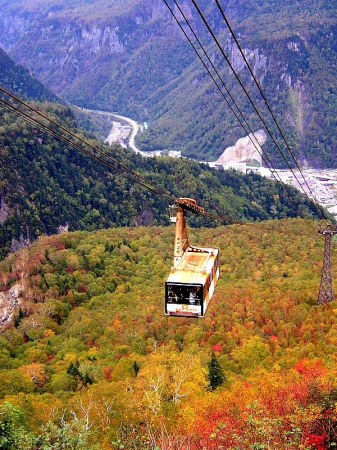 Kamikawa-cho is a town popular among domestic and foreign tourists for its nature and Sounkyo Onsen spreading out at the foot of Daisetsuzan National Park Kurodake. 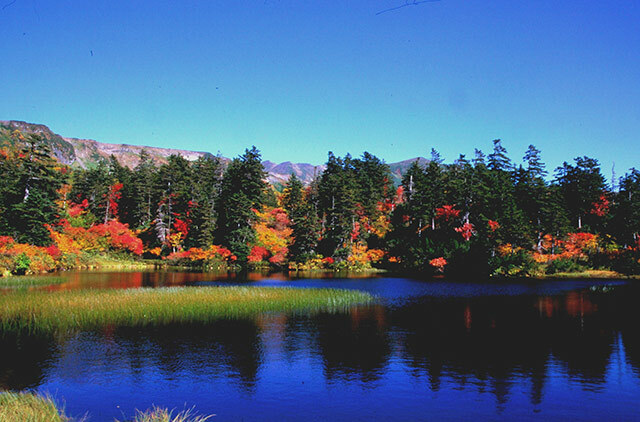 Here, you can enjoy the colors of winter, spring, summer and autumn with the untouched Nature of the Daisetsuzan federation. 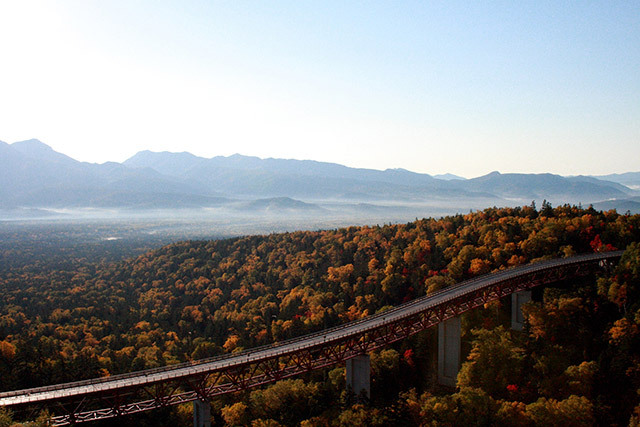 It can be said that it is the star attraction of Hokkaido nature walks. 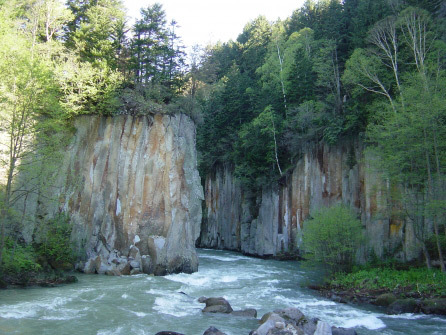 Also, you can enjoy the powerful geological scene where the bedrock that is shaped in hexagonal pillars called columnar joints can be seen. 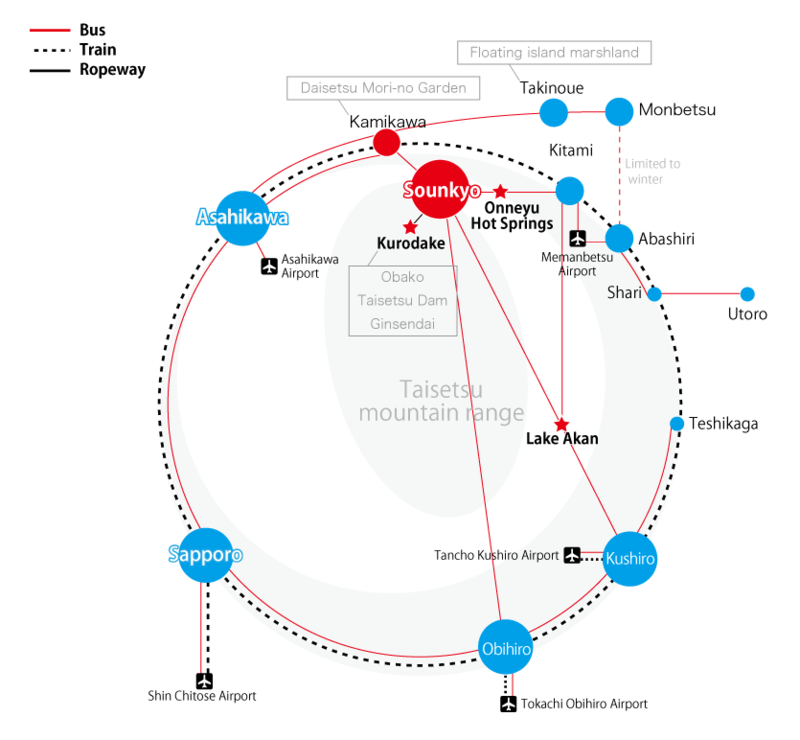 Kamikawa-cho is a connecting point of traffic leading to Abashiri-shi and Shiretoko peninsula on the Okhotsk coast, Kitami-shi, Obihiro-shi, Lake Akan, and Kushiro-shi. The winter is so cold that even the waterfall running down the cliff is frozen solid. 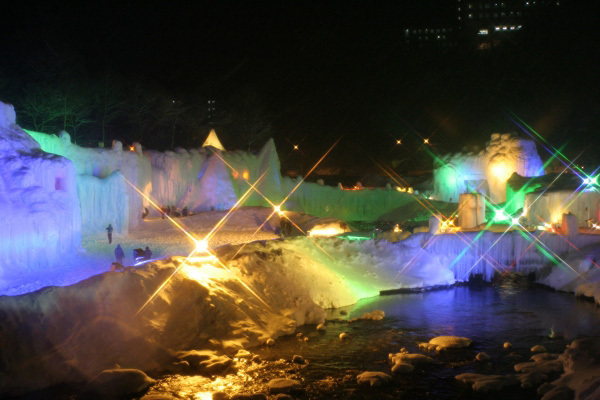 The waterfalls become huge icefalls and ice sculptures along the Ishikari River are lit up by prismatic colored lighting giving off a mysterious appearance. Fireworks are launched on the weekend, too and color the winter night sky. Visitors Sounkyo Onsen are treated with floral art. 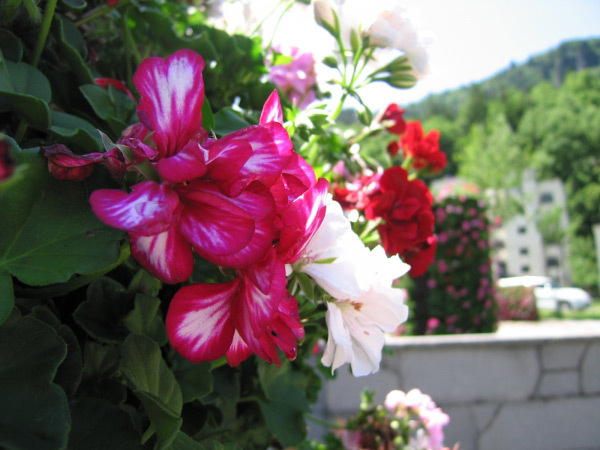 Lodging facilities and shopping streets are colored gorgeously with beautiful flowers and works of art. 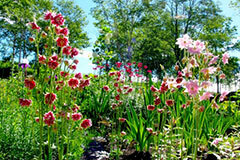 There are even more great spots to take pictures, as Sounkyo becomes a town of flowers. Sounkyo's greatest summer event. This is a re-enactment of the Owl Ritual that is the traditional rite of the Indigenous Ainu People. 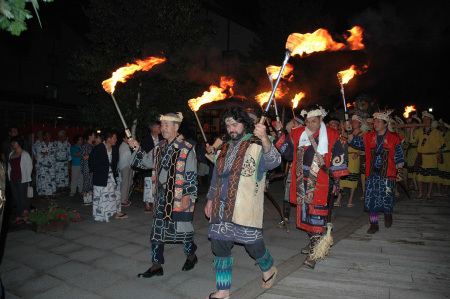 Performers compete to color the gorge with the light of the fire, and carry out drumming and ancient Indigenous Ainu ritual dancing solemnly and mysteriously. Asahikawa Station (Departure) 9:15a.m. 10:45a.m. 0:15p.m. 2:35p.m. 3:45p.m. 4:35p.m. 8:00p.m. Kamikawa mori no terasu bus touch (Departure) 10:35a.m. 0:05p.m. 1:35p.m. 3:55p.m. 5:05p.m. 5:55p.m. 2:35p.m. Sounkyo (Arrival) 11:05a.m. 0:35p.m. 2:05p.m. 4:25p.m. 5:35p.m. 6:25p.m. 8:30p.m. Sounkyo (Departure) 6:20a.m. 7:45a.m. 8:40a.m. 10:55a.m. 1:30p.m. 3:40p.m. 5:30p.m. Kamikawa mori no terasu bus touch (Departure) 6:55a.m. 8:20a.m. 9:15a.m. 11:30a.m. 2:05p.m. 4:10p.m. 6:00p.m. Asahikawa Station (Arrival) 8:10a.m. 9:35a.m. 10:30a.m. 0:45p.m. 3:20p.m. 5:30p.m. 7:20p.m. Asahikawa (Departure) 9:02a.m. 11:18a.m. 4:43p.m. 7:08p.m. Kamikawa (Departure) 9:42a.m. 0:01p.m. 5:31p.m. 7:52p.m. Kamikawa (Departure) 9:25a.m. 0:31p.m. 4:43p.m. 8:20p.m. Asahikawa (Arrival) 10:09a.m. 1:11p.m. 5:11p.m. 8:59p.m. terasu bus touch (Departure) 11:30a.m. terasu bus touch (Arrival) 5:10p.m. Asahikawa Station (Departure) 8:00a.m. 3:35p.m. Lake Akan (Arrival) 1:03p.m. 8:38p.m. Lake Akan (Departure) 9:33a.m. 5:08p.m. Asahikawa Station (Arrival) 2:35p.m. 10:10p.m. Asahikawa Station (Departure) 8:15a.m. 10:15a.m. 2:15p.m. 4:15p.m. Kamikawa (Departure) 9:15a.m. 11:15a.m. 3:15p.m. 5:15p.m. Sounkyo (Departure) 9:52a.m. 11:52a.m. 3:52p.m. 5:52p.m. Onneyu (Departure) 10:58a.m. 0:58p.m. 4:58p.m. 6:58p.m. Kitami Bus Terminal (Arrival) 11:45a.m. 1:45p.m. 5:45p.m. 7:45p.m. Kitami Bus Terminal (Departure) 8:15a.m. 10:15a.m. 2:15p.m. 4:15p.m. Onneyu (Departure) 9:01a.m. 11:01a.m. 3:01p.m. 5:01p.m. Sounkyo (Departure) 10:12a.m. 0:12p.m. 4:12p.m. 6:12p.m. Kamikawa (Departure) 10:40a.m. 0:40p.m. 4:40p.m. 6:40p.m. Asahikawa Station (Arrival) 11:45a.m. 1:45p.m. 5:45p.m. 7:45p.m.